As the Tax Forum is to be overshadowed by recession, participants should remember that all taxes suppress productive activity, except holding taxes on indestructible, irreplaceable, immobile assets, the returns to which are economic rent. A tax on any other factor of production can be avoided by destroying the factor, or by failing to produce or replace it, or by moving it out of the jurisdiction. A tax on transactions can be avoided by avoiding the transactions. All these modes of avoidance amount to lost production within the jurisdiction. Taxes that can be avoided in any of these ways are costs of production and must be recovered through prices if production is to continue. Hence they are inflationary. Hence they raise the non-accelerating-inflation rate of unemployment (NAIRU), the maintenance of which is the target of monetary policy. The most obvious tax on production is income tax. On the macroeconomic scale, income is production: national “income” is net national “product”. It follows that income tax raises prices. The widespread belief that income tax doesn't feed into prices, while a consumption taxes does, is based on the assumption that if a consumption tax replaced income tax, gross wages/salaries would be held constant. Under that assumption, the personal income tax presently withheld from wages/salaries would instead be paid to employees, and the consumption tax would need to come from another source, namely higher prices. But if net wages/salaries were held constant, the total funds presently paid to the government as PAYE income tax would instead be paid to the government as consumption tax; there would be no need for enterprises to find extra revenue, hence no overall price rise. In either case, prices charged by unincorporated sole traders would behave similarly to those charged by employers (due to competition for customers, and arbitrage between working for oneself and working for an employer). On the macro scale, income is production. But on the micro scale, on which income tax is assessed, one entity's income can be another's production. Such is economic rent. So an income tax, with appropriate inclusions and exemptions, can target economic rent and spare the returns to production. In practice, however, income taxes invariably do the opposite, because economic rent buys political influence. Thus capital gains get concessional treatment, although they overwhelmingly represent economic rent rather than capital formation (and although CGT resembles a holding tax in that the taxable gain accumulates while the asset is held). Meanwhile income from capital, which really does contribute to capital formation (and is a transaction or series of transactions), gets no such concessions. Thus, in Australia, current losses incurred in pursuit of capital gains (“negative gearing”) are deductible against wage income although they are not incurred in pursuit of wages, while commuting costs incurred in pursuit of wages are not deductible against them. A consumption tax by its very nature is indifferent to whether consumption is financed out of production or economic rent. So it is not so easily rigged in favour of rent-takers. This is an advantage not only in efficiency, but also in equity, because the flow of economic rent is highly concentrated towards the rich (e.g. in Australia in 2005-6, the top 1% of income earners got 5.3% of wage/salary income and 38.6% of net capital gains). The belief that consumption taxes are less equitable than income taxes is another symptom of the assumption that gross wages/salaries would be held constant in the transition. Under that assumption, the abolition of the progressive personal income tax would overcompensate high income earners for the price rise, and undercompensate low income earners. But if net wages/salaries were held constant, there would be no price rise and no change in wage relativities. Using the industrial relations power (which is mostly in Federal hands under the corporations power), governments can ensure that net wages/salaries are maintained for existing appointments. New appointments can be subject to a new IR regime, preferably with an additional per-shift payment as an implicit loading for part-timers and casuals. This “shift bonus” would replicate the progressiveness of the existing system with respect to working hours, so that (e.g.) a worker on 18 hours/week would take home more than half the pay of an equal-ranked colleague on 36 hours/week. The shift bonus would also eliminate the need for minimum-shift rules. As the producers of “necessities of life” are not exempt from income tax, there is no need to exempt them from a consumption tax that replaces income tax on a price-neutral basis. All this could be done while leaving the existing narrow-based GST untouched, as the Government has decreed. Unlike income tax, a consumption tax does not reduce the return on saving and investment (expressed as the ratio of future consumption to present consumption). Thus it is more conducive to capital formation and less damaging to production. Of course a consumption tax suppresses production by reducing effective demand for products. But this effect, unlike the suppressive effect of income tax, is diluted by trade: as a consumption tax applies only to consumption within the jurisdiction, it discourages foreign production for importation, but does not discourage domestic production for exportation. Neither does it drive away capital used in production for global markets. Because other countries can impose their own consumption taxes, the trade advantage is a first-mover advantage, which makes action all the more urgent. The other advantages of a consumption tax are permanent. 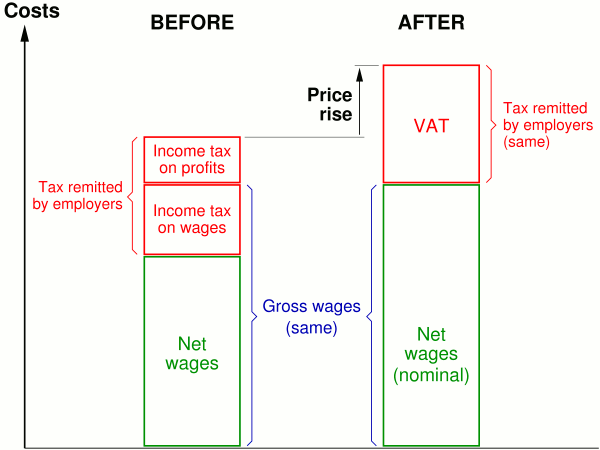 * First published (without the diagrams) as a comment on “Chart of the Day: Taxes are all wrong” at MacroBusiness. 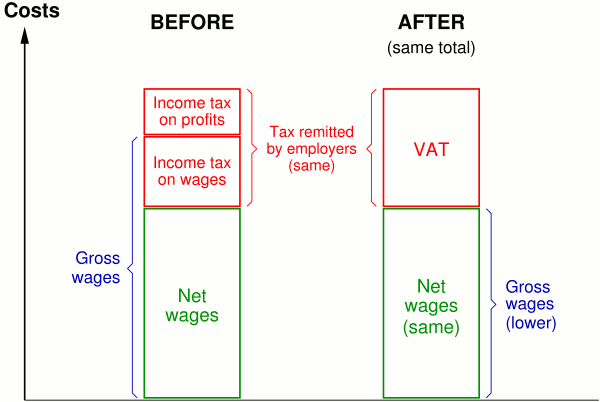 For convenience, the diagrams assume that the consumption tax is implemented as a VAT. A retail tax would have a similar effect on consumer prices, except that its compliance costs would be lower.